How the rocks are formed? Rocks are made up of substances called minerals. Any naturally occurring solid substance with a definite chemical composition is called a mineral. 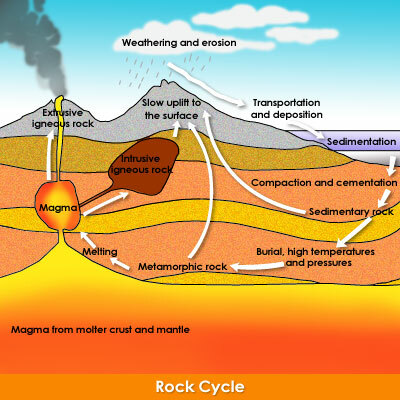 All rocks are formed in the Earth’s lithosphere, which includes the Earth’s crust and the top part of its mantle, where partially molten rock called magma flows very slowly under the crust. Some rocks are formed when magma gets close to the surface and slowly cools. Some of that red-hot magma breaks through the Earth’s crust to form fiery volcanoes, releasing lava to cool quickly on the surface or even underwater. Other rocks form as a result of the weathering of older rocks and erosion, creating layers of sediments, which are eventually buried under more sediment and changed by heat and pressure. Some rocks are even formed from the remains of living things. How do you classify igneous, sedimentary and metamorphic rocks? There are three major classes of rocks – igneous, sedimentary and metamorphic. 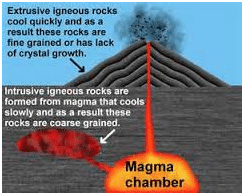 Rocks that form from the cooling of magma below the Earth’s crust or lava are called igneous rocks. 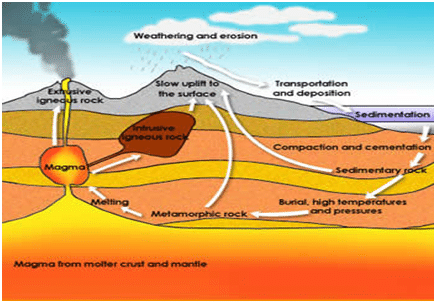 Igneous rocks that form from red-hot lava above the Earth’s surface are called extrusive rocks. 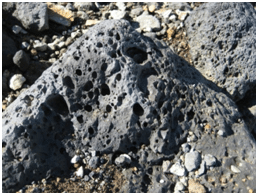 Igneous rocks that form from the lava spilling from underwater volcanoes are also classified as extrusive rocks. How quickly the lava or magma cooled. 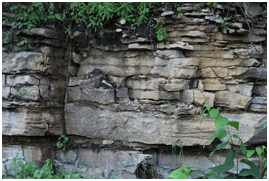 Rocks that are formed from the particles of sediments are called sedimentary rocks. Sediments are deposited when weathered rock is moved from one place to another by the wind, running water, the sea or glaciers. That process is called erosion. 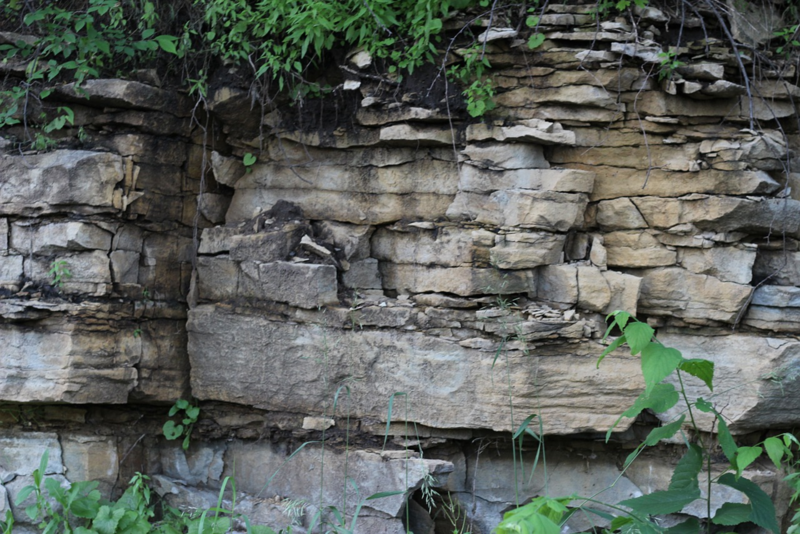 Deposits of dead plants and animals are also called sediments. Sand deposited by the wind forms sand dunes, especially in coastal areas where sand is picked up and blown inland until it is stopped by obstacles such as rock or vegetation. A fast-moving river is likely to carry with it sand, gravel and smaller particles. As it slows down on its path to the sea, the river loses energy and particles are deposited, forming sediments. The larger particles, such as gravel and sand, settle first. By the time the river reaches the sea, it is usually travelling so slowly that the very fine mud particles begin to settle. During floods when rivers break their banks, sediments are deposited on flat, open land beside the river. These plains are called floodplains. The water in fast ‑moving rivers, along with the weathered rock it takes with it, can carve out deep valleys in the Earth’s surface. One of the most spectacular examples of this is the Grand Canyon in Arizona, USA. In the coldest regions of the Earth, especially at high altitudes, bodies of ice called glaciers slowly make their way down slopes. Igneous and sedimentary rocks deep below the Earth’s surface are buried under the huge weight of the rocks, sediments and soil above them. They are also subjected to high temperatures. The temperature increases by about 25°C for every kilometer below the surface. This heat and pressure can change the composition and appearance of the minerals in rocks. the rocks that are formed by these changes are called metamorphic rocks. Rocks are made up of substances called …………. Rocks that are formed from the particles of sediments are called……………… rocks. A fast-moving river is likely to carry with it sand, gravel and smaller particles. As it slows down on its path to the sea, the river loses energy and particles are deposited, forming ………………. The process of change in the rocks is called metamorphism and the rocks that are formed by these changes are called ………………. rocks. All rocks are formed in the Earth’s atmosphere, which includes the Earth’s crust and the top part of its mantle. Sediments are deposited when weathered rock is moved from one place to another by the wind, running water, the sea or glaciers. That process is called metamorphism. The heat and pressure can change the composition and appearance of the minerals in rocks.